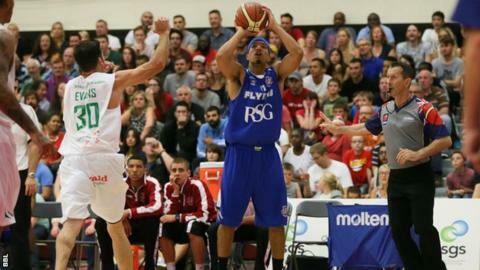 Bristol Flyers secured the last spot in the BBL Play-offs with victory against Leeds Force in the final game of their debut top-flight season. Flyers went into the closing weekend in the final post-season place, although Manchester Giants could have gone above them with two wins from three games. But Giants lost to Newcastle Eagles, Sheffield Sharks and London Lions, Flyers beat fellow rookies Force. "It means everything," said Flyers guard Greg Streete. "We don't want to be waiting on other teams' results, we want to know we are in the top eight because we put ourselves there. "It sends a clear message to the rest of the league that we are a legitimate club and we are here to win." With several injury concerns and having already clinched the title, BBL Championship winners Eagles rested key players and fell to Cheshire Phoenix and Leicester Riders. Glasgow Rocks were the other big winners of the final weekend, prevailing in the three-way battle for fifth position by overcoming Surrey United, Force and Plymouth Raiders. Rocks meet Phoenix in the Play-offs, after the Cheshire club marked the final league game at Northgate Arena with victory against Sharks. Worcester Wolves beat Durham Wildcats on Sunday and welcome London in the Play-offs after the capital club finished sixth following a weekend win against Giants - while Wildcats forfeited their final away game having been involved in a road traffic accident. Raiders edged United on Friday as they finished in 10th position. The BBL Play-off final on 10 May will be shown live on the BBC Sport website and BBC Red Button. Sheffield Hatters and Nottingham Wildcats will renew their rivalry in Sunday's first-ever WBBL Play-off Final, after coming through their respective semi-finals against Barking Abbey Crusaders and Leicester Riders. Hatters have already beaten Wildcats into second place in the WBBL Championship and WBBL Trophy.